Before the advent of the grain elevator, grain was usually handled in bags rather than in bulk (large quantities of loose grain). Dart's Elevator was a major innovation. 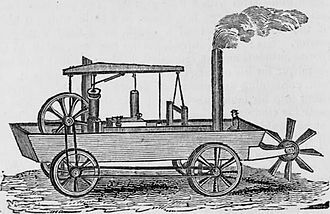 It was invented by Joseph Dart, a merchant, and Robert Dunbar, an engineer, in 1842 and 1843, in Buffalo, New York. Using the steam-powered flour mills of Oliver Evans as their model, they invented the marine leg, which scooped loose grain out of the hulls of ships and elevated it to the top of a marine tower. Early grain elevators and bins were often built of framed or cribbed wood, and were prone to fire. Grain-elevator bins, tanks, and silos are now usually made of steel or reinforced concrete. Bucket elevators are used to lift grain to a distributor or consignor, from which it falls through spouts and/or conveyors and into one or more bins, silos, or tanks in a facility. When desired, silos, bins, and tanks are emptied by gravity flow, sweep augers, and conveyors. As grain is emptied from bins, tanks, and silos it is conveyed, blended, and weighted into trucks, railroad cars, or barges, and shipped to grain wholesalers, exporters, and/or local end-users, such as flour mills, breweries, and ethanol and alcohol distilleries. In Australian English, the term "grain elevator" is reserved for elevator towers, while a receival and storage building or complex is distinguished by the formal term receival point or as a "wheat bin" or "silo". Large-scale grain receival, storage, and logistics operations are known in Australia as bulk handling. In Canada, the term "grain elevator" is used to refer to a place where farmers sell grain into the global grain distribution system, and/or a place where the grain is moved into rail cars or ocean-going ships for transport. Specifically there are several types of grain elevators under Canadian law, defined in the Canadian Grain Act, Section 2. Primary elevators (called "country elevators" before 1971) receive grain directly from producers for storage, forwarding, or both. Process elevators (called "mill elevators" before 1971) receive and store grain for direct manufacture or processing into other products. Terminal elevators receive grain on or after official inspection and weighing and clean, store, and treat grain before moving it forward. Transfer elevators (including "Eastern elevators" from the pre-1971 classification) transfer grain that has been officially inspected and weighed at another elevator. In the Eastern Division, transfer elevators also receive, clean, and store eastern or foreign grain. The Port Perry mill and grain elevator, circa 1930. Originally built in 1873, it is the oldest grain elevator in Canada and remains a major landmark to this day. The original line of the PW&PP Railway can be seen in the foreground. Typical "wood-cribbed" design for grain elevators throughout Western Canada. A common design used from the early 1900s to mid-1980s. Built in 1925, the former Ogilvie Flour Mill elevator in Wrentham, Alberta, Canada. It was both necessity and the prospect of making a lot of money that gave birth to the steam-powered grain elevator in Buffalo, New York, in 1843. Due to the completion of the Erie Canal in 1825, Buffalo enjoyed a unique position in American geography. 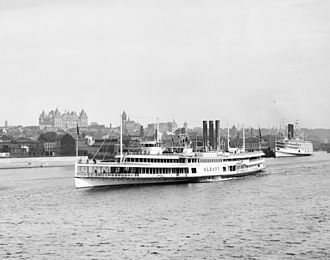 It stood at the intersection of two great all-water routes: one extending from New York Harbor, up the Hudson River, to Albany and, beyond it, the Port of Buffalo; the other constituted by the Great Lakes, which could theoretically take boaters in any direction they wished to go (north to Canada, west to Michigan or Wisconsin, south to Toledo and Cleveland, or east to the Atlantic Ocean). 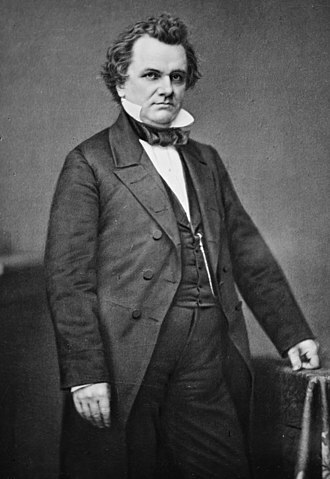 All through the 1830s, Buffalo benefited tremendously from its position. In particular, it was the recipient of most of the increasing quantities of grain (mostly wheat) that was being grown on farms in Ohio and Indiana, and shipped on Lake Erie for transshipment to the Erie Canal. If Buffalo hadn't been there, or when things got backed up there, that grain would have been loaded onto boats at Cincinnati and shipped down the Mississippi River to New Orleans. By 1842, it was clear that Buffalo's port facilities were antiquated. They still relied upon techniques that had been in use since the European Middle Ages: work teams of stevedores would use block and tackles and their own backs to unload or load each and every sack of grain that had been stored or was to be stored in the boat's hull. It would take several days, sometimes even a week, to service a single grain-laden boat. 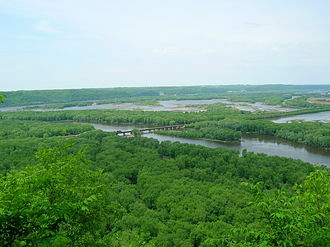 Grain shipments were going down the Mississippi River, not over the Great Lakes/Erie Canal system. A merchant named Joseph Dart, Jr., is generally credited as being the one who adapted Oliver Evans' grain elevator (originally a manufacturing device) for use in a commercial framework (the transshipment of grain in bulk from lakers to canal boats), but the actual design and construction of the world's first steam-powered "grain storage and transfer warehouse" was executed by an engineer named Robert Dunbar. Thanks to the historic Dart's Elevator (operational on 1 June 1843), which worked almost seven times faster than its non-mechanized predecessors, Buffalo was able to keep pace with—and thus further stimulate—the rapid growth of American agricultural production in the 1840s and 1850s, but especially after the Civil War, with the coming of the railroads. It wasn't by accident that the world's second and third grain elevators were built in Toledo, Ohio and Brooklyn, New York, in 1847. 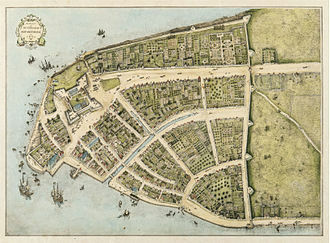 Fledgling American cities, they were connected through an emerging international grain trade of unprecedented proportions. Grain shipments from farms in Ohio were loaded onto ships by elevators at Toledo; these ships were unloaded by elevators at Buffalo that transshipped their grain to canal boats (and, later, rail cars), which were unloaded by elevators in Brooklyn, where the grain was either distributed to East Coast flour mills or loaded for further transshipment to England, the Netherlands, or Germany. But this eastern flow of grain was matched by an equally important flow of people and capital in the opposite direction, that is, from East to West. 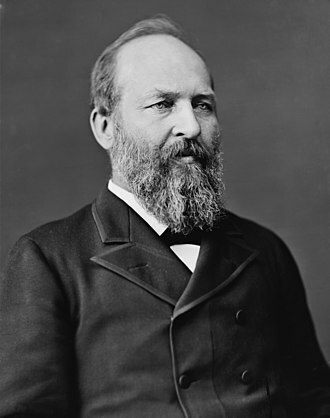 Because of the money to be made in grain production and, of course, because of the very existence of an all-water route to get there, increasing numbers of immigrants in Brooklyn came to Ohio, Indiana, and Illinois to become farmers. More farmers meant more prairies turned into farmlands, which in turn meant increased grain production, which of course meant that more grain elevators would have to be built in places like Toledo, Buffalo, and Brooklyn (and Cleveland, Chicago, and Duluth). It was precisely through this feedback loop of productivity—set in motion by the invention of the grain elevator—that America itself became an agricultural and economic colossus on the world stage: the planet's single largest producer of wheat, corn, oats, and rice, a distinction it claims to this day. In the early twentieth century, there was concern about monopolistic practices in the grain elevator industry, leading to testimony before the Interstate Commerce Commission in 1906. This led to several grain elevators being burned down in Nebraska, allegedly in protest. Today, grain elevators are a common sight in the grain-growing areas of the world, such as the North American prairies. Larger terminal elevators are found at distribution centers, such as Chicago and Thunder Bay, Ontario, where grain is sent for processing, or loaded aboard trains or ships to go further afield. Buffalo, New York, the world's largest grain port from the 1850s until the first half of the 20th century, once had the nation's largest capacity for the storage of grain in over thirty concrete grain elevators located along the inner and outer harbors. While several are still in productive use, many of those that remain are presently idle. In a nascent trend, some of the city's inactive capacity has recently come back online, with an ethanol plant started in 2007 using one of the previously mothballed elevators to store corn. In the early 20th century, Buffalo's grain elevators inspired modernist architects such as Le Corbusier, who exclaimed, "The first fruits of the new age!" when he first saw them. 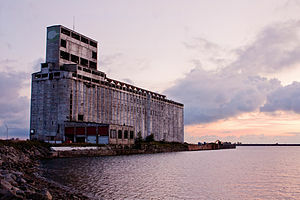 Buffalo's grain elevators have been documented for the Historic American Engineering Record and added to the National Register of Historic Places. Currently, Enid, Oklahoma, holds the title of most grain storage capacity in the United States. In farming communities, each town had one or more small grain elevators that would serve the local growers. The classic grain elevator was constructed with wooden cribbing and had nine or more larger square or rectangular bins arranged in 3 × 3 or 3 × 4 or 4 × 4 or more patterns. Wooden cribbed elevators usually had a driveway with truck scale and office on one side, a rail line on the other side and additional grain storage annex bins on either side. In more recent times with improved transportation, centralized and much larger elevators serve many farms. Some of them are quite large. Two elevators in Kansas (one in Hutchinson and one in Wichita) are half a mile long. The loss of the grain elevators from small towns is often considered a great change in their identity, and there are efforts to preserve them as heritage structures. At the same time, many larger grain farms have their own grain handling facilities for storage and loading onto trucks. Grain elevator operators buy grain from farmers, either for cash or at a contracted price, and then sell futures contracts for the same quantity of grain, usually each day. They profit through the narrowing basis, that is, the difference between the local cash price, and the futures price, that occurs at certain times of the year. Before economical truck transportation was available, grain elevator operators would sometimes use their purchasing power to control prices. This was especially easy since farmers often had only one elevator that was within a reasonable distance of their farm. This led some governments to take over the administration of grain elevators. An example of this is the Saskatchewan Wheat Pool. For the same reason, many elevators were purchased by cooperatives. These houses in Halifax, Nova Scotia, were constructed in the 1990s long after the elevator had been constructed and are valuable due to their location. In the summer of 2003, there was an explosion at this elevator, sparking a fire that took seven hours to extinguish. A recent problem with grain elevators is the need to provide separate storage for ordinary and genetically modified grain to reduce the risk of accidental mixing of the two. In the past, grain elevators sometimes experienced silo explosions. Fine powder from the millions of grains passing through the facility would accumulate and mix with the oxygen in the air. A spark could spread from one floating particle to the other creating a chain reaction that would destroy the entire structure. (This dispersed-fuel explosion is the mechanism behind fuel-air bombs.) To prevent this, elevators have very rigorous rules against smoking or any other open flame. Many elevators also have various devices installed to maximize ventilation, safeguards against overheating in belt conveyors, legs, bearing, and explosion-proof electrical devices such as electric motors, switches, and lighting. Grain elevators in small Canadian communities often had the name of the community painted on two sides of the elevator in large block letters, with the name of the elevator operator emblazoned on the other two sides. This made identification of the community easier for rail operators (and, incidentally, for lost drivers and pilots). The old community name would often remain on an elevator long after the town had either disappeared or been amalgamated into another community; the grain elevator at Ellerslie, Alberta, remained marked with its old community name until it was demolished, which took place more than twenty years after the village had been annexed by the City of Edmonton. One of the major historical trend in the grain trade has been the closure of many smaller elevators, and the consolidation the grain trade to fewer places and among fewer companies. For example, in 1961 there were 1642 "country elevators" (the smallest type) in Alberta, holding 3,452,240 tonnes (3,397,720 long tons; 3,805,440 short tons) of grain. By 2010 there were only 79 remaining "primary elevators" (as they are now known), holding 1,613,960 tonnes (1,588,470 long tons; 1,779,090 short tons). A view along Buffalo's "Elevator Alley." 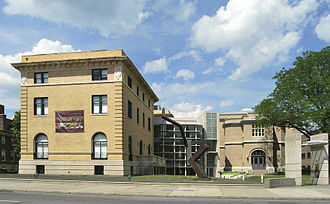 The city of Buffalo, New York is not only the birthplace of the modern grain elevator, but has the world's largest number of extant examples. A number of the city's historic elevators are clustered along "Elevator Alley," a narrow stretch of the Buffalo River immediately adjacent to the harbor. The alley runs under Ohio Street and along Childs Street in the city's First Ward neighborhood. In Canada the term elevator row refers to a row of four or more wood-crib prairie grain elevators. In the early pioneer days of Western Canada's prairie towns, when a good farming spot being settled, many people wanted to make money by building their own grain elevators. This brought in droves of private grain companies. Towns boasted dozens of elevator companies which all stood in a row along the railway tracks. If a town was lucky enough to have two railways, it was to be known as the next Montreal. In many elevator rows there would be two or more elevators of the same company. Small towns bragged of their large elevator rows in promotional pamphlets to attract settlers. With so much competition in the 1920s, consolidation began almost immediately, and many small companies were merged or absorbed into larger companies. In the mid-1990s, with the cost of grain so low, many private elevator companies once again had to merge, this time causing thousands of "prairie sentinels" to be torn down. Because so many grain elevators have been torn down, Canada has only one surviving elevator row, located in Inglis, Manitoba. The Inglis Grain Elevators National Historic Site has been protected as a National Historic Sites of Canada. ABB Grain – founded as a mutual company, the Australian Barley Board, in 1939, by barley growers in South Australia and Victoria; after demutualization, it was acquired by Viterra (see below) in 2009; Australian Bulk Alliance, a joint venture between ABB and Sumitomo, operates facilities in some areas. All companies operating elevators in Canada must be licensed by the Canadian Grain Commission, which maintains a list of all licensed companies currently operating in the country. Paterson grain – established in 1908 as the N. M. Paterson Co. In Sweden, the vast majority of grain elevators belong to the Lantmännen co-operative movement, owned by grain-growing farmers. During the Battle of Stalingrad, one particularly well-defended Soviet strongpoint was known simply as "the Grain Elevator" and was strategically important to both sides. This is a list of grain elevators that are either in the process of becoming heritage sites, museums, or have been preserved for future generations. Swissmill Tower in upper Limmat Valley in the Canton of Zürich – 118 metres (387 ft) high, rebuilt by April 2016. Sewell's Point grain elevator, export elevator built by the city of Norfolk in 1922 to help the port of Norfolk better compete with other East Coast ports by providing a publicly owned facility to store and load grain at reasonable rates. It was sold to the Norfolk and Western railroad in 1929, and leased from N&W by Continental grain in 1952. The elevator originally held 750,000 bushels but was later expanded to 3.5 million bushels. The elevator was taken over by Cargill in the late 1980s and abandoned around the turn of the 21st century. The elevator was demolished by Norfolk Southern in 2008. Southern States silos, a grain elevator in Richmond, Virginia originally built in the 1940s by Cargill and currently leased by Perdue Farms is the tallest structure south of the James River in the city of Richmond. The elevator was the site of the 3rd RVA Street Art Festival. Chase Grain Elevator, Tile Grain Elevator built in 1922. Sun Prairie, Wisconsin Placed on the National Register of Historic Places in 2010. It is the last remaining tile elevator in Wisconsin. Given a large enough suspension of combustible flour or grain dust in the air, a significant explosion can occur. A historical example of the destructive power of grain explosions is the 1878 explosion of the Washburn "A" Mill in Minneapolis, Minnesota, which killed eighteen, leveled two nearby mills, damaged many others and caused a destructive fire that gutted much of the nearby milling district. (The Washburn "A" mill was later rebuilt and continued to be used until 1965.) Another example occurred in 1998, when the DeBruce grain elevator in Wichita, Kansas, exploded and killed seven people. The most recent example is an explosion on October 29, 2011, at the Bartlett Grain Company in Atchison, Kansas. The death toll was six people. Two more men received severe burns, but the remaining four were not hurt. Almost any finely-divided organic substance becomes an explosive material when dispersed as an air suspension; hence, a very fine flour is dangerously explosive in air suspension. This poses a significant risk when milling grain to produce flour, so mills go to great lengths to remove sources of sparks. These measures include carefully sifting the grain before it is milled or ground to remove stones which could strike sparks from the millstones, and the use of magnets to remove metallic debris able to strike sparks. The earliest recorded flour explosion took place in an Italian mill in 1785, but there have been many since. The following two references give numbers of recorded flour and dust explosions in the United States in 1994 and 1997 In the ten-year period up to and including 1997, there were 129 explosions. Canadian Prairie grain elevators were the subjects of the National Film Board of Canada documentaries Grain Elevator and Death of a Skyline. During the sixth season of the History Channel series Ax Men, one of the featured crews takes on the job of dismantling the Globe Elevator in Wisconsin. This structure was the largest grain storage facility in the world when it was built in the 1880s. ^ a b c d Brown, William J. (2013). American Colossus: The Grain Elevator 1843 to 1943. Colossal Books. ISBN 978-0578012612. ^ "Descriptions of types of grain elevators licensed by the Canadian Grain Commission". Grainscanada.gc.ca. 2010-01-12. Archived from the original on 2013-11-20. Retrieved 2013-03-28. ^ "Grain elevator explosion rocks Halifax". CBC News. 2003-08-08. ^ Huffstutter, P.J. ; Plume, Karl (11 April 2017). "Grains piled on runways, parking lots, fields amid global glut". Reuters. Retrieved 12 April 2017. ^ "Grain Elevator Conference". Urban Design Project:: University at Buffalo. Urban Design Project, State University of New York at Buffalo. Archived from the original on 4 March 2016. Retrieved 22 November 2013. ^ Cook, Michael; Papciak, Bryan (2010). Elevator Alley. Furnace Press. ISBN 9780977274260. ^ "licences". Grainscanada.gc.ca. 2002-05-05. Retrieved 2013-03-28. ^ "Vanishing Sentinels". Vanishingsentinels.blogspot.com. 2005-12-30. Retrieved 2013-03-28. ^ "Acadia Valley elevator". 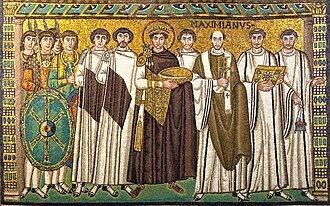 Wayback.archive.org. 2009-08-16. Archived from the original on August 16, 2009. Retrieved 2013-03-28. ^ "Alberta Central Railroad Museum". Abcentralrailway.com. Retrieved 2013-03-28. 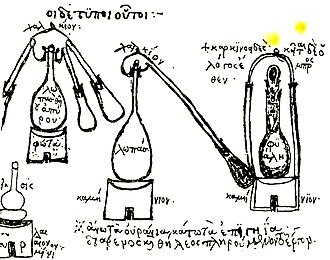 ^ "Castor elevator". Albertasource.ca. 2010-12-08. Retrieved 2013-03-28. ^ Dean Tiegs. "Big Valley elevator". Canadiannorthern.ca. Archived from the original on 2013-10-03. Retrieved 2013-03-28. ^ "Ritchie Mill – Edmonton". Rmlo.com. Retrieved 2013-03-28. ^ "Heritage Acres". Heritage Acres. Retrieved 2013-03-28. ^ "Calgary Heritage Park". Heritagepark.ca. Retrieved 2013-03-28. ^ "Alberta Legacy Development Society – Leduc". Leducelevator.com. Retrieved 2013-03-28. ^ "Mayerthorpe elevator". Mayerthorpe.ca. 2012-12-06. Retrieved 2013-03-28. ^ "Meeting Creek elevator". Canadiannorthern.ca. Retrieved 2013-03-28. ^ "Canadian Grain Elevator Discovery Center – Nanton". Nantonelevators.com. Retrieved 2013-03-28. ^ "Radway elevator". Townlife.com. 2008-09-24. Retrieved 2013-03-28. ^ "South Peace Centennial Museum". Spcm.ca. Retrieved 2013-03-28. ^ "Stettler elevator". Boomtowntrail.com. Retrieved 2013-03-28. 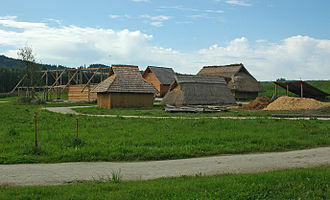 ^ "Ukrainian Cultural Heritage Village". Tapor.ualberta.ca. Retrieved 2013-03-28. ^ "Dictionary of Canadian Biography: De 1921 à 1930 - Ramsay Cook, Jean Hamelin - Google Books". Books.google.ca. Retrieved 2013-03-28. ^ "Sukanen Ship Pioneer Village & Museum". Sukanenmuseum.ca. Archived from the original on 2013-02-18. Retrieved 2013-03-28. ^ Florian Niedermann (2016-04-27). "Der Swissmill-Tower spaltet Zürich" (in German). Limmattaler Zeitung. Retrieved 2016-05-19. ^ "Climb Up OKC". ClimbUpGym.com. Climb Up, LLC. ^ "RVA Street Art Festival headed to Manchester silos". Retrieved 11 December 2016. ^ "Third RVA Street Art Festival brings flood of creativity to Manchester". 19 April 2016. Retrieved 11 December 2016. ^ "June 8, 1998 - DeBruce Grain Elevator Explosion". City of Wichita. City of Wichita. 1998. Archived from the original on February 12, 2008. Retrieved 2007-06-22. ^ Sutton, Joe (October 30, 2011). "3 killed, 3 missing after Kansas grain elevator explosion". CNN.com. ^ "A report of grain dust explosions that took place in 1994" (PDF). Archived from the original (PDF) on 2007-01-24. Retrieved 2007-06-23. ^ "A report of grain dust explosions that took place in 1997" (PDF). Archived from the original (PDF) on 2007-01-24. Retrieved 2007-06-23. ^ "Grain Elevator". Documentary film. National Film Board of Canada. Retrieved 22 July 2010. ^ Smith, Bryan (2003). "Death of a Skyline". National Film Board of Canada. Retrieved 2009-03-19. Wikimedia Commons has media related to Grain elevators. Vanishing Landmarks: Photographs of standing and demolished Grain Elevators with information and maps. "Inside a Modern Grain Elevator" Popular Science Monthly, February 1930, p. 45. Drawing of how 1930s grain elevator worked at sea ports. The Cargill Pool Elevator is a grain storage facility in Buffalo harbor built in the 1920s and previously named the Saskatchewan Cooperative Elevator. The elevator is the grain elevator located on Buffalos outer harbor. Completed in 1925, the elevator was constructed by a co-operative of Canadian wheat farmers known as the Saskatchewan Co-operative Elevator Company. The cooperative owned the elevator until 1945 but turned over operations to Superior Grain Corporation. It was purchased in 1945 by investors who called themselves the Pool Elevator Company, pillsbury purchased the elevator facility in January 1952 for $1 million. The Cargill company purchased the facility in 1964 as a facility for grain. Cargill eventually left Buffalo, abandoning the building, Cargill allowed the Pool to stand idle and to become delinquent in property tax payments. Upon default, the city of Buffalo placed the Pool on the auction block, the Pool Elevator, like all other grain elevators in Buffalo, was deeply affected by the 1959 opening of the St.
Lawrence Seaway. Because the Buffalo elevators could be by-passed outright via the Seaway, fewer customers each year saw value in unloading grain to an elevator, the Pool Elevator transfer facility offered a total holding capacity of 2.1 million US bushels in 135 bins. The mainhouse features a capacity of 1.11 million US bushels of stored in 33 main cylindrical bins. Two of which are subdivided vertically to provide four quarter bins, twenty interspace bins, the elevator was built in stages, as evidenced by the different extensions to the bins that make up the current structure. The two lakeside marine legs could siphon off 250,000 US bushels every eight hours, numerous boxcars were subsequently loaded on a track that could accommodate fifty-two cars at a time. The Pool could load 100 cars per day, each with a 200, virtually all receipts and shipments were in bulk, and the elevator handled a wide variety of wheat, oats and other grains. The building is owned by South End Marina, and used for general storage. Thunder Bay is a city in, and the seat of, Thunder Bay District, Canada. It is the most populous municipality in Northwestern Ontario with a population of 108,359 as of the Canada 2011 Census, European settlement in the region began in the late 17th century with a French fur trading outpost on the banks of the Kaministiquia River. Forestry and manufacturing played important roles in the citys economy and they have declined in recent years, but have been replaced by a knowledge economy based on medical research and education. Thunder Bay is the site of the Thunder Bay Regional Research Institute, the city takes its name from the immense Thunder Bay at the head of Lake Superior, known on 18th-century French maps as Baie du Tonnerre. 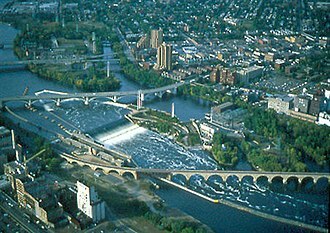 The city is referred to as the Lakehead, or Canadian Lakehead. 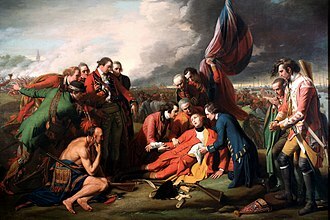 European settlement at Thunder Bay began with two French fur trading posts which were subsequently abandoned, in 1803, the Montreal-based North West Company established Fort William as its mid-continent entrepôt. The fort thrived until 1821 when the North West Company merged with the Hudsons Bay Company, by the 1850s, the Province of Canada began to take an interest in its western extremity. Discovery of copper in the Keweenaw Peninsula of Michigan had prompted a demand for mining locations on the Canadian shores of Lake Superior. In 1849, French-speaking Jesuits established the Mission de lImmaculée-Conception on the Kaministiquia to evangelize the Ojibwe, the Province of Canada negotiated the Robinson Treaty in 1850 with the Ojibwa of Lake Superior. As a result, an Indian reserve was set aside for them south of the Kaministiquia River, in 1859–60, the Department of Crown Lands surveyed two townships and the Town Plot of Fort William for European-Canadian settlement. Another settlement developed a few miles to the north of Fort William after construction by the federal Department of Public Works of a road connecting Lake Superior with the Red River Colony, the work was directed by Simon James Dawson. Grains are small, dry seeds, with or without attached hulls or fruit layers, harvested for human or animal consumption. Agronomists call the plants producing such seeds grain crops, the two main types of commercial grain crops are cereals such as wheat and rye, and legumes such as beans and soybeans. Because of the ubiquity of grain as a source, the term grain is often used to describe something small. After being harvested, dry grains are more durable than other foods, such as starchy fruits. Thus, major global commodity markets exist for canola, rice, wheat, in botany and cereals are synonymous with caryopses, the fruits of the grass family. In agronomy and commerce, seeds or fruits from other plant families are called if they resemble caryopses. For example, amaranth is sold as grain amaranth, and amaranth products may be described as whole grains, the pre-Hispanic civilizations of the Andes had grain-based food systems but, at the higher elevations, none of the grains was a cereal. All three grains native to the Andes are broad-leafed plants rather than such as corn, rice. Logistics is generally the detailed organization and implementation of a complex operation. In a general sense, logistics is the management of the flow of things between the point of origin and the point of consumption in order to meet requirements of customers or corporations. The resources managed in logistics can include items such as food, animals, equipment. The logistics of physical items usually involves the integration of information flow, material handling, packaging, transportation and often security. In military science, logistics is concerned with maintaining army supply lines while disrupting those of the enemy, since an armed force without resources and transportation is defenseless. Military logistics was already practiced in the ancient world and as modern military have a significant need for logistics solutions, in military logistics, logistics officers manage how and when to move resources to the places they are needed. The complexity of logistics can be modeled, visualized, the minimization of the use of resources is a common motivation in all logistics fields. A professional working in the field of management is called a logistician. The prevalent view is that the term comes from the late 19th century. Others attribute a Greek origin to the word, λόγος, meaning reason or speech, λογιστικός, the Oxford English Dictionary defines logistics as the branch of military science relating to procuring and transporting material and facilities. As such, logistics is commonly seen as a branch of engineering that creates people systems rather than machine systems and that being said, from a modeling perspective, there are similarities between operations management and logistics, and companies sometimes use hybrid professionals, with for ex. Director of Operations or Logistics Officer working on similar problems, the term supply chain management originally refers to, among other issues, having an integrated vision in of both production and logistics from point of origin to point of production. All these terms may suffer from semantic change as an effect of advertising. Outbound logistics is the related to the storage and movement of the final product. A silo is a structure for storing bulk materials. Silos are used in agriculture to store grain or fermented feed known as silage, Silos are more commonly used for bulk storage of grain, cement, carbon black, food products and sawdust. Three types of silos are in use today, tower silos, bunker silos. There are different types of cement silos such as the low-level mobile silo and the static upright cement silo, the low-level silos are fully mobile with capacities from 10 to 75 tons. They are simple to transport and are easy to set up on site and these mobile silos generally come equipped with an electronic weighing system with digital display and printer. This allows any quantity of cement or powder discharged from the silo to be controlled, the static upright silos have capacities from 20 to 80 tons. These are considered an option for the storage of cement or other powders. Cement silos can be used in conjunction with bin-fed batching plants, Cement can be stored in different types of Silos like Horizontal Mobile Silos, Concrete Silos, Steel Panel Silos etc. depending upon the requirement of the end user. While Mobile Silos come in a small storage capacity of approximately 90MT of Cement. A majority of Silos that store more than 5000 MT of Cement are constructed from Concrete, a good compromise between cost, construction time and ease of operation is Steel Panel Silos. Storage silos are cylindrical structures, typically 10 to 90 ft in diameter and 30 to 275 ft in height with the slipform and Jumpform concrete silos being the diameter and taller silos. They can be made of many materials, wood staves, concrete staves, cast concrete, and steel panels have all been used, and have varying cost and airtightness tradeoffs. Silos storing grain and woodchips are typically unloaded with air slides or augers, Silos can be unloaded into rail cars, trucks or conveyors. Bottom silo unloaders are utilized at times but have problems with difficulty of repair, an advantage of tower silos is that the silage tends to pack well due to its own weight, except in the top few feet. However, this may be a disadvantage for items like chopped wood, the tower silo was invented by Franklin Hiram King. 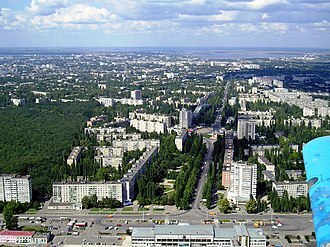 Mykolaiv, known as Nikolaev or Nikolayev, is a city in southern Ukraine, the administrative center of the Mykolaiv Oblast. Mykolaiv is arguably the main ship building center of the Black Sea, population,494, 763 The city is an important transportation junction of Ukraine. Mykolaivs orderly layout reflects the fact that its development has been planned from the founding of the city. Its main streets, including the three main east–west Avenues, are wide and tree lined. A significant part of Mykolaivs land area consists of beautiful parks, park Peremohy is a large park on the peninsula just north of the city center of Mykolaiv, on the north side of the Inhul river. The city uses two names and Russian, there are several transliterations of each name, the Ukrainian name of the city is Микола́їв, transliterated as Mykolaiv, or Mykolayiv. The Russian name, Никола́ев, transliterates as Nikolaev or as Nikolayev, the citys founding was made possible by the Russian conquests during the Second Russo-Turkish War of 1787-1792. Founded by Prince Grigory Potemkin, Nikolaev was the last of the cities he established. 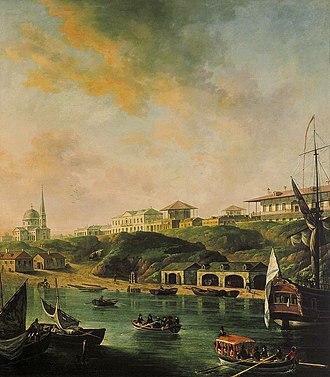 On 27 August 1789, Potemkin ordered its naming near the wharf at the mouth of the Ingul river, on a high, cool, to build the city he brought in peasants and Turkish prisoners,2,500 were working there during 1789. Potemkin named the city after Saint Nicholas, the patron of seafarers, the name Nikolaev is known from the legal order Number 1065 by Prince Potemkin to Mikhail Faleev dated 27 August 1789. On 15 April 1924 the Plenum of the Central Administrative-Territorial Commission of the VUTSIK considered and rejected the petition of the Odessan executive committee, perhaps the members of the Soviet-Ukraine government thought that the name sounded too obsequious. The city was designated as Nikolaev in publications of the map in other languages. Mykolaiv is the center of Mykolaiv Oblast, as well as that of both Mykolaiv and Vitovka Raions within the oblast. It is administratively incorporated as a city of oblast significance, Mykolaiv is located on a peninsula in Ukraines steppe region 65 kilometers from the Black Sea along the estuary of the Southern Bug river. The Erie Canal is a canal in New York that is part of the east–west, cross-state route of the New York State Canal System. Originally, it ran about 363 miles from Albany, on the Hudson River, to Buffalo and it was built to create a navigable water route from New York City and the Atlantic Ocean to the Great Lakes. 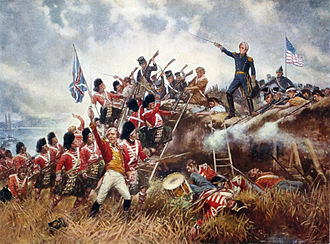 First proposed in the 1780s, re-proposed in 1807, a survey was authorized, proponents of the project gradually wore down opponents, its construction began in 1817. The canal has 35 numbered locks, plus the Federal Black Rock Lock, and it opened on October 26,1825. In a time when bulk goods were limited to pack animals and it was faster than carts pulled by draft animals, and cut transport costs by about 95%. The canal fostered a population surge in western New York and opened regions farther west to settlement and it was enlarged between 1834 and 1862. The canals peak year was 1855, when 33,000 commercial shipments took place. In 1918, the part of the canal was enlarged to become part of the New York State Barge Canal, which ran parallel to the eastern half of the Erie Canal. Mainly used by recreational watercraft since the retirement of the last large ship, the Day Peckinpaugh in 1994. This was not unique to the Americas, and the still exists in those parts of the world where muscle power provides a primary means of transportation within a region. An equally ancient solution was implemented in many cultures — things in the water weighed far less and freight had to travel overland, a journey made more difficult by the rough condition of the roads. In 1800, it typically took 2.5 weeks to travel overland from New York to Cleveland, the principal exportable product of the Ohio Valley was grain, which was a high-volume, low-priced commodity, bolstered by supplies from the coast. 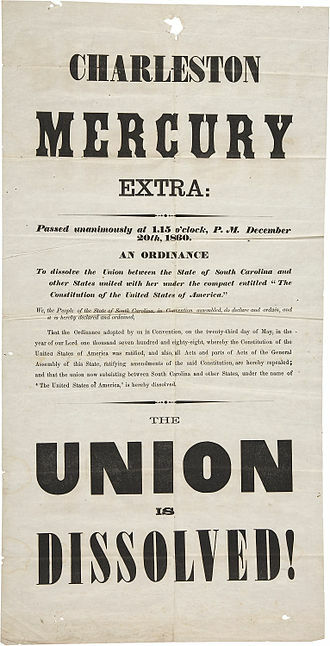 Frequently it was not worth the cost of transporting it to far-away population centers and this was a factor leading to farmers in the west turning their grains into whiskey for easier transport and higher sales, and the Whiskey Rebellion. In time, projects were devised in Virginia, Pennsylvania, the successes of the Canal du Midi in France, Bridgewater Canal in Britain, and Eiderkanal in Denmark spurred on what was called in Britain canal mania. A stevedore, docker, dock laborer, wharf rat, whombler, and/or longshoreman is a waterfront manual laborer who is involved in loading and unloading ships. The word stevedore originated in Portugal or Spain, and entered the English language through its use by sailors. In Canada, the term stevedore has used, for example, in the name of the Western Stevedoring Company, Ltd. based in Vancouver. Loading and unloading ships requires knowledge of the operation of loading equipment, the techniques for lifting and stowing cargo. In addition, workers must be strong and be able to follow orders attentively. In order to unload a ship successfully, many longshoreman are needed, there is only a limited amount of time that a ship can be at a port, so they need to get their jobs done quickly. In earlier days before the introduction of containerization, men who loaded and unloaded ships had to tie down cargoes with rope, a type of stopper knot is called the stevedore knot. The methods of tying up parcels of goods is called stevedore lashing or stevedore knotting. Today, the vast majority of cargo is transported in intermodal containers. The containers arrive at a port by truck, rail or another ship and are stacked in the storage area. When the ship that will be transporting them arrives, the containers that it is offloading are unloaded by a crane, the containers either leave the port by truck or rail or are put in the storage area until they are put on another ship. Once the ship is offloaded, the containers it is leaving with are brought to the dock by truck, a crane lifts the containers from the trucks into the ship. As the containers pile up in the ship, the workers connect them to the ship and those workers at the port who handle and move the containers are likely to be considered stevedores or longshoremen. Before containerization, freight was handled with a longshoreman’s hook. 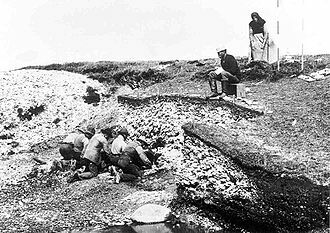 Traditionally, stevedores had no fixed job, but would arrive at the docks in the morning seeking employment for the day, London dockers called this practice standing on the stones, while in the United States it was referred to as shaping. Toledo is a city in and the county seat of Lucas County, United States. Toledo is in northwest Ohio, at the end of Lake Erie bordering the state of Michigan. 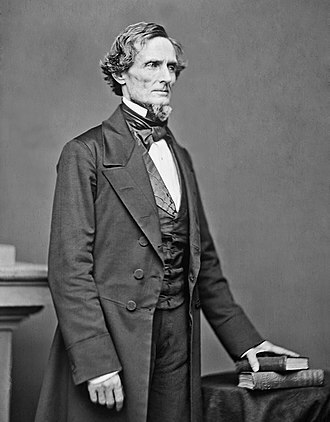 The city was founded by United States citizens in 1833 on the west bank of the Maumee River and it was re-founded in 1837, after conclusion of the Toledo War, when it was incorporated in Ohio. 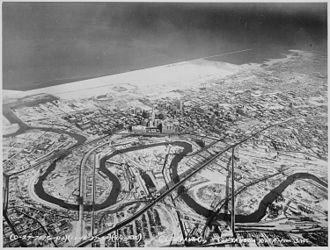 After construction of the Miami and Erie Canal, Toledo grew quickly and it has since become a city with an art community, auto assembly businesses, education and local sports teams. The citys glass industry has earned it the nickname, The Glass City, the population of Toledo as of the 2010 Census was 287,208, making it the 71st-largest city in the United States. 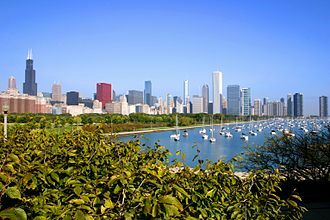 It is the fourth most populous city in the U. S. state of Ohio after Columbus and Cincinnati. 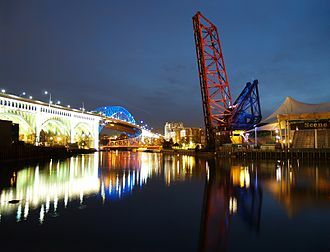 The Toledo metropolitan area had a 2010 population of 651,429, and was the sixth-largest metropolitan area in the state of Ohio, behind Cleveland, Cincinnati and Akron. Varying cultures of indigenous peoples lived along the rivers and lakefront of what is now northwestern Ohio for thousands of years, when the city of Toledo was preparing to pave its streets, it surveyed two prehistoric semicircular earthworks, presumably for stockades. One was at the intersection of Clayton and Oliver streets on the bank of Swan Creek. Such earthworks were typical of mound-building peoples and this region was part of a larger area controlled by the historic tribes of the Wyandot and the people of the Council of Three Fires. The first European to visit the area was Étienne Brûlé, a French-Canadian guide and explorer, the French established trading posts in the area by 1680 to take advantage of the lucrative fur trade. The Odawa moved from Manitoulin Island and the Bruce Peninsula at the invitation of the French and they settled an area extending into northwest Ohio. By the early 18th century, the Odawa occupied areas along most of the Maumee River to its mouth and they served as middlemen between the French and tribes further to the west and north. The Wyandot occupied central Ohio, and the Shawnee and Lenape occupied the southern areas, the area was not settled by European-Americans until 1795 and after. They were finally defeated in 1794 at the Battle of Fallen Timbers and this loose affiliation of tribes included the Wyandot and Council of Three Fires. "View of the City of Nikolaev", painting by Fedor Alexeev, 1799. 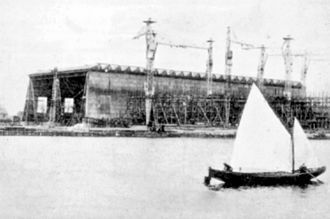 Shipyard in Mykolaiv circa 1900. Soviet-era apartment blocks in Mykolaiv. While once grain was sold by the sack, it is now moved in bulk in huge ships like this. Hopper-bottomed railcars, such are this one from Japan, have made moving grain much faster and less labour-intensive. American wooden clerestory cars on display at the Mid-Continent Railway Museum in North Freedom, Wisconsin, United States.